Naruto Manga Chapter 485 So Close, and Yet so Far is already out. Naruto and Sasuke finally meet, The class clown and the elite, guts and hatred in a point - blank brawl. Naruto tell Sasuke that he understand why Sasuke did it. But Sasuke ask Naruto to shut up because naruto would never understand his feel. Sasuke also tell them his feel after kill Danzou, like he was finally cleansing the Uchiha name of the stigma that's dogged it for all these year. Kakashi starting know what turned Sasuke into what he is now. Kakashi ask Naruto and Sakura to get out from there, but Naruto can't let it happen. By kagebunshin, one of his clone hold Kakashi and the others clone release rasengan. 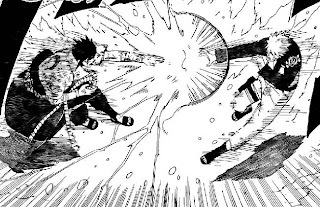 After long time ago, finally we see Chidori vs Rasengan again.